The game started with a few boxes and the first task was to get a goat to move from one box to another. At first I attached code to every single box and made each of them respond as a button. However this can be very taxing on the cpu as every cpu cycle was calling all code from each box and checking if it were pressed. This was severely unplayable. When you first start something like this you don’t know what the hardware is capable of or what it isn’t so my initial thought was this kinda game was probably not possible so I parked the idea for a day and was ready to send the files to the project archives. But I thought about it a bit more and tried a few more things removing the code from all the boxes then program the button functionality into the touch object that hits the boxes, so that it would reduce the cpu cycles from being called from 50 boxes down to 1 touch object. A lot of the programming for the game was roughly written but then as I learnt more about what how you could optimise and get more out of efficient coding, I re-wrote the code several times over in different ways each time gaining a more speed and fluidity. After gaining in speed I thought I might push the graphics to something a bit more complicated and see if the iPhone could hold up. 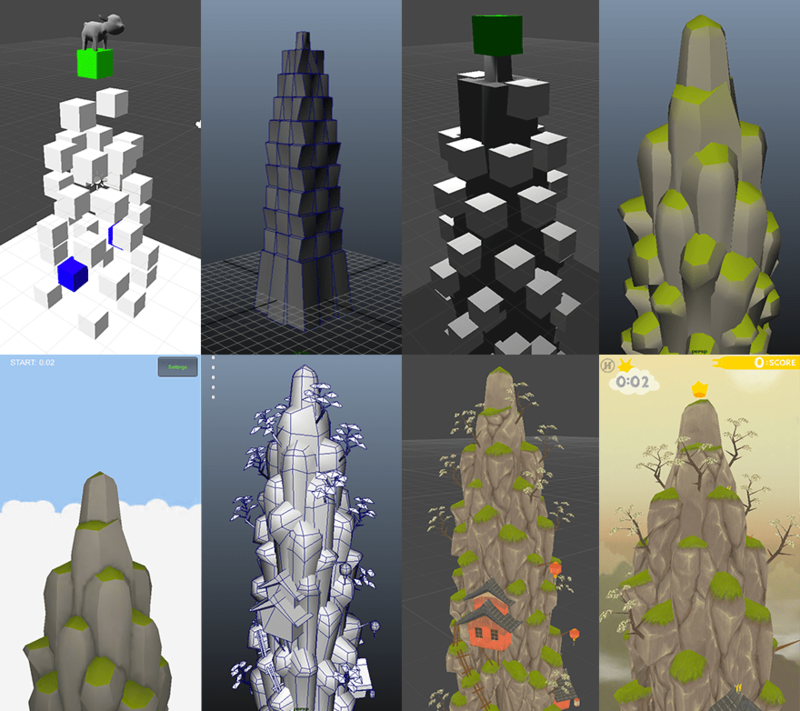 So from boxes I began to iterate from a grey mesh tower then to a simple shaded mountain with vertex colour. I thought this was looking pretty good at this stage so I added a bit of ambient occlusion to give the mountain some nice softness to resemble more of a kid robot like style. The problem with ambient occlusion is that each piece of geometry has to have its own UV layout and a large map to have sufficient enough detail and smoothness in the shading, so if you want to add more detail to without losing resolution, the texture map will need to be huge and its going to use too much memory. That was my excuse for not adding more detail to the stage. I was sorta happy with it at the time and though that was the graphics done. As long as I’ve been a 3D artist I’ve never really like the 3D look. So I eventually got tired of looking at this simple 3D shaded style and made the next big iteration for the stage design. I added more complexity and environment features such as trees and houses. I also wanted a more illustrated anime like feel so I watched a lot of Ghibli movies and decided to get rid of all 3D lights and ambient occlusion and just stick with pure illustrated textures. This freed me up from using massive texture maps and complicated UV layouts. I found that I could put a lot more detail into the scenes than what was needed to be modelled in 3D.